Outside Krakow, Poland. December 2008. An upcoming staff and parent art exhibit at our school has given me good occasion to have a look back through some of the older photographs I’ve taken, but not shared or printed. 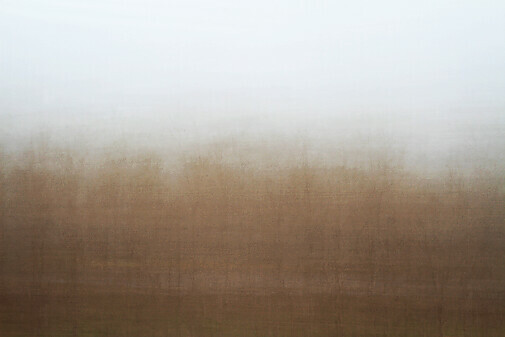 I took these photographs on the morning of New Year’s Eve in 2008. We were visiting Poland for the first time and we wanted to visit Auschwitz. We didn’t want to be part of a big tour; we wanted to go more quietly, so we hired a private guide who recommended that we leave at from Krakow at dawn. 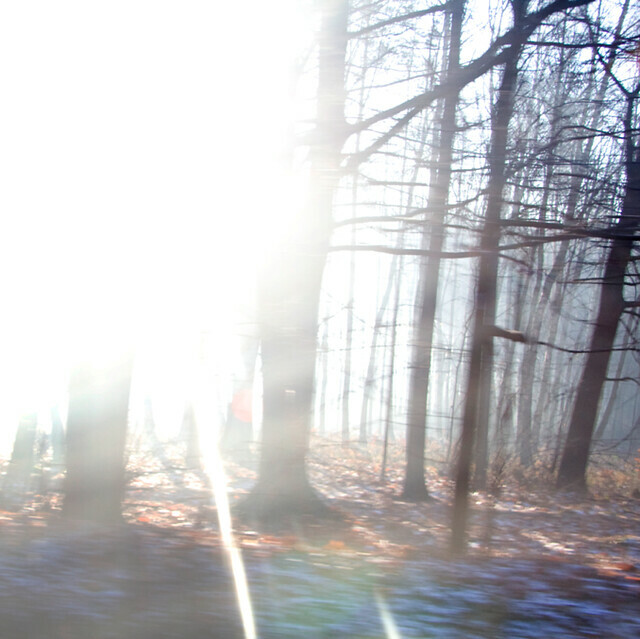 It was one of those mornings where the clear blue skies and warm sunlight made me think it should feel warm, but the air was so crisp and clean and cold that it froze the inside of my nose with every breath. And that was the contrast of the day. 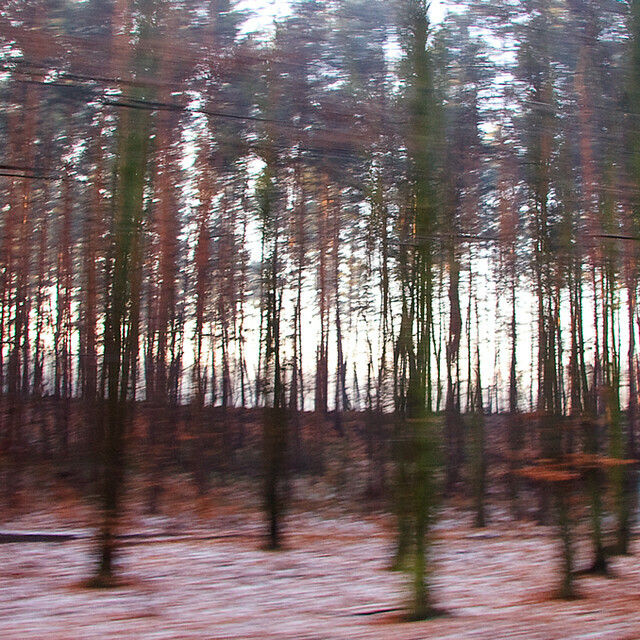 The road to Auschwitz was watched over by stands of trees that seemed full and sparse at the same time; the early light cut between them, warming their bark and green needles and moss, and stretched out their shadows to define them in hyper-reality. And yet there was also an emptiness about them, the space between so palpable and full of absence. That negative space pervaded the camps at Birkenau, but where the trees were draped in the daybreak’s radiance, the remains of Birkenau were chilling in every way. There was a wreath somewhere along the way. 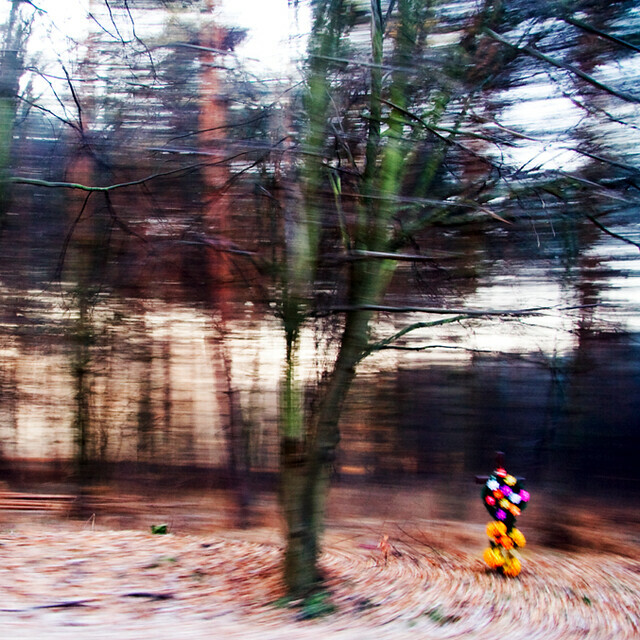 I’m not even sure that I saw it as our car sped by, but my camera caught it, its bright flowers aflame in the interstice. I don’t know why that wreath was there, or who placed it, or when, or whether it was marked by ceremony or if it was just set down, unnoticed by all the cars racing toward their imposed importances beyond the vanishing points of the hills and roads. But it’s frozen there now in a photograph at least, a testament of someone’s loss that without specific reference, without a name or story of how and why, becomes symbolic of all the losses I can’t imagine in those woods, along those roads. And more than that, it leaves me considering that only where love survives can we really remember. 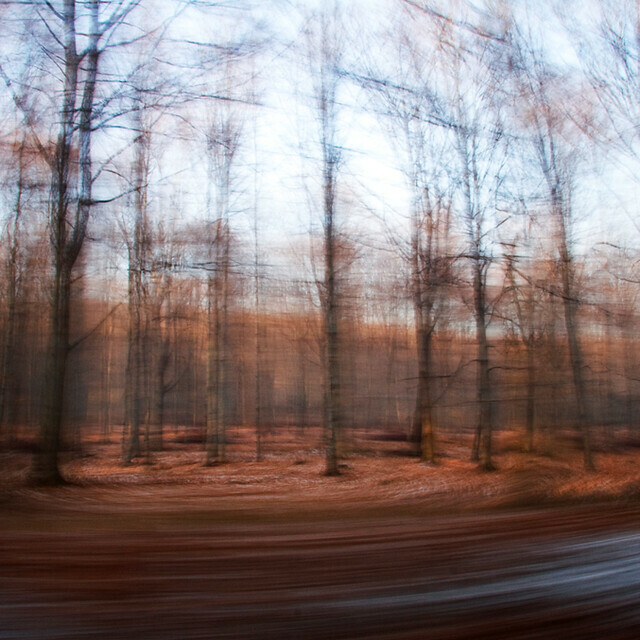 This entry was posted in Abstract & Motion, Landscape, Photography and tagged Auschwitz, Birkenau, car, Dawn, Daybreak, December, Flowers, Forest, Krakow, loss, Morning, New Year's Day, Pines, Poland, Remembrance, Snow, Sunrise, Trees, Winter, Woods, Wreath on April 13, 2014 by damienpitter. Between Shanghai and Beijing, China. April 2013. Apparently I am also allergic to them, but whatever. I like the way light falls between them in streaks and patches and flickering shimmers and long shadows like roads to vanishing fairy-lands. How they cut light into shafts that transect the trodden paths and the spaces between. I like how strong trees are and how tall and how even old trees somehow smell new. I like the way they reach up and down at the same time. I like the way they move, bending, swaying without losing ground. I like the way they creak. I like the way they change the way the air moves, the kind of stillness you feel walking into a stand of trees, like first steps into an invisible temple, the positive presence of negative space. I like their leaves in all the colours and shapes and sizes, the sound of the wind blowing through them just before they fall into fiery fall blankets underfoot. I like the way trees collect snow. I like the patience of trees. It was a tree in Texas that taught me the value of the smallest patch of shade. I like the connectedness of trees when they grow together in forests. I like their defiance when they grow by themselves. I like trees that grow, impossibly, through fences and from sheer faces of limestone and granite. There’s something about a tree that feels sentient. Maybe it’s because they stand up, but it just feels like they know things. The witness trees at Auschwitz kept their silence but made me want to weep. I couldn’t look at them for too long lest I catch their eye and learn the whole story, and I, lacking tree-strength, had as much as I could bear with only the eyes of an hour. 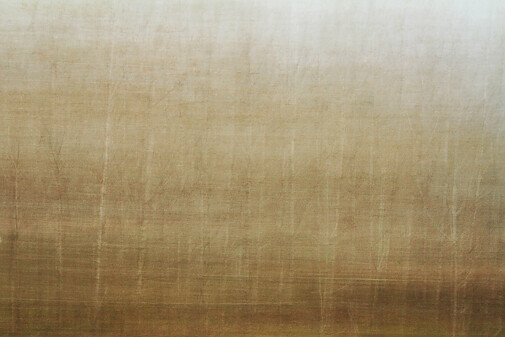 These trees grew in the moments between dust patches on the journey from Shanghai to Beijing. I didn’t catch their story as we sped by, just a vertical impression, a thin stand against the speed of flight and the unsettling of dust. 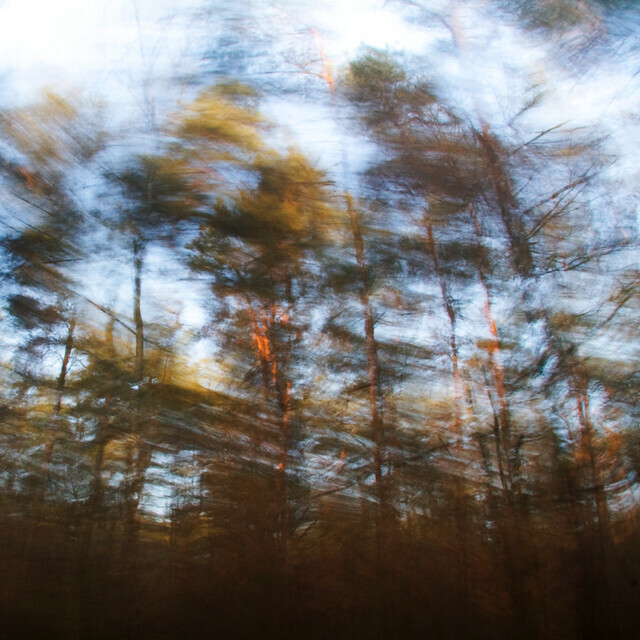 This entry was posted in Abstract & Motion, Photography and tagged Abstract, Beijing, Blurry, Forest, Impressionist, Motion, Peking, Shanghai, Train, Trees on June 10, 2013 by damienpitter. Near Salisbury, England. June 2011. 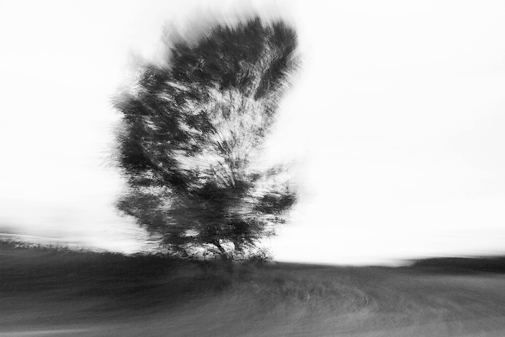 This entry was posted in Abstract & Motion, Black & White, Landscape, Photography and tagged Abstract, Blurry, Britain, England, Great Britain, Motion, Salisbury, Tree, Trees, United Kingdom on March 25, 2013 by damienpitter. This entry was posted in Digital Collage, Media and tagged Birch Trees, Chandelier, Trees, Versaille, Winter on September 10, 2010 by damienpitter. This entry was posted in Black & White, Landscape, Photography and tagged Alberta, Banff, Black & White, BW, Canada, Evergreen, Mountains, River, Trees on August 5, 2010 by damienpitter. This entry was posted in Black & White, Landscape, Photography and tagged Alberta, Banff, Black & White, BW, Canada, Evergreen, Mountains, Trees on August 5, 2010 by damienpitter.